Shiner players, above, accept the Class 1A state championship trophy from UIL official Peter Contreras, left, after beating the Stratford Elks 33-19 Saturday night at Wichita Falls' Memorial Stadium. WICHITA FALLS - Chris Baer knew he was standing among a throng of happy Shiner fans at Memorial Stadium on Saturday night, but for a moment the senior thought he might be dreaming. "This is a great ending," Baer said. "It hasn't all sunk in for me. It kind of seems fake to me." There was nothing fake about the four touchdowns Baer scored, or the Class 1A state championship trophy he held up as the result of Shiner's 33-19 state final victory over Stratford. "I knew it was possible," Baer said of the Comanches' 16-0 season and the second state championship in school history. "But you never know what can happen. This is the perfect ending. I don't know what to say." Baer spoke volumes by rushing for 128 yards and three touchdowns, recording eight tackles, including three for a loss and two sacks, and blocking an extra point, as Shiner put last year's state final loss behind them while equaling the accomplishment of the 1986 Class 2A team. 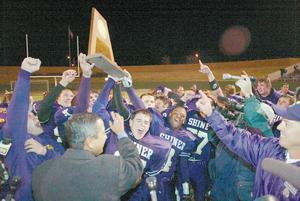 "With these kids, we definitely thought it was possible," Shiner coach Steven Cerny said. "We tried not to look at the big picture and just take it a week at a time." Shiner overcame an explosive Stratford team with big plays and a determined defensive effort. The Elks (13-3) had an almost 11-minute edge in overall time of possession, including an 8:36 advantage in the second half, and ran 75 plays to 39 for Shiner. But the Comanches forced four turnovers and responded to every Stratford score with one of their own. "We knew they were going to make some yardage, but we kept our heads up and stuck to it," said Shiner nose guard Dustin Pohler, who had a team-high 10 tackles, including 3 1/2 sacks, and forced a fumble. "We were getting tired. But we thought about our goal and kept going." Stratford got its offense going on its second possession, when quarterback Josh King found running back Tony Ruiz in the flat behind the Shiner defense and the running back ran 88 yards for a touchdown with 7:03 left in the first quarter. But it took Shiner only 15 seconds to tie the game, as Baer received the kickoff at the Shiner 12, found a hole on the right side and somehow kept his balance after being hit near the Stratford 35 before completing the 88-yard return. "That kickoff return was huge," Cerny said. "That swung things back our way again. In a big game like this, momentum is everything. If they had stopped us there and scored, they might have won the game." The Comanches overcame a 53-yard kickoff return by Case Crabtree and stopped Stratford on downs at the Shiner 29 when Nick Evans hit Josh Lanning for a 3-yard loss after he had caught a pass from King. The Comanches needed only five plays to take the lead, and Baer carried on the last four, scoring on a 28-yard run with 2:55 left in the first quarter before Scott Shimek added the first of three extra points. "Our offensive line did a great job of getting a push," said Baer, who carried 21 times and had four runs of over 10 yards. "I just tried to hit the holes and run as hard as I could." Stratford pulled within a point by driving 49 yards in eight plays, while making two first downs on Shiner penalties. King scored on an 8-yard run to make it 14-13 with 7:14 left in the second quarter, but Baer came through the middle to block the extra-point attempt. "We made too many mistakes," said King, who passed for 204 yards and one touchdown, but was intercepted twice and sacked six times. "We played well, but we made too many mistakes and gave them the ball." Shiner took the ball 67 yards in seven plays, and scored on a 6-yard run by Baer with 3:54 left in the second quarter. The touchdown was set up by a 43-yard run by Kenzley Wright on an option play. "We never could pull away from them," Baer said. "But I felt like as long as we could keep the lead, we'd be all right." Stratford pulled within two after Ryan McDaniel recovered a fumble at the Shiner 12. King scored on a 3-yard run with 3:37 left in the third quarter. But King's two-point conversion pass attempt to Lanning was knocked away by Chase O'Connor. "There were a lot of times we could have gotten down," Cerny said. "But our defense has stepped up all year round and they came through again when we needed it." The special teams came through for Shiner when O'Connor returned the ensuing kickoff 37 yards to the Stratford 36. On the next play, Trey Curtis threw his only completion of the game for a touchdown to Nick Evans. "In the second half, it seemed like we never had the ball," Cerny said. "But we got the big play when we needed it." The defense set up Shiner's final score when linebacker Ryan Kloesel forced a fumble that Kevin Berger picked up and returned to the Stratford 15. Baer carried four straight times before scoring his 40th rushing touchdown of the season with 2:58 remaining in the fourth quarter, and setting the stage for a long, but pleasant bus ride home. "Every play was a wakeup call for us," said Baer, who finished the season with 2,120 yards rushing. "We just had to reach down and find something extra. This was just a great game all together." Rushing - Stratford: Tony Ruiz 15-74, Josh King 23-20, Gustavo Rosales 3-1. Passing - Stratford: King 14-33-2 204 yards, Walter Spurlock 1-1-0 15 yards. Shiner: Curtis 1-2-0 36 yards, Baer 0-1-0 0 yards. Walter Spurlock 1-26, Josh Lanning 1-(minus 3), Josh King 1-(minus 7). Stratford: Tony Ruiz 88 pass from Josh King (Martin Beltran kick), 7:03. Shiner: Chris Baer 88 kickoff return (Scott Shimek kick), 6:48. Shiner: Baer 28 run (Shimek kick), 2:55. Stratford: King 8 run (kick blocked), 7:14. Shiner: Baer 6 run (Shimek kick), 3:54. Stratford: King 3 run (pass failed), 3:37. Shiner: Nick Evans 36 pass from Trey Curtis (kick failed), 3:20. Shiner: Baer 1 run (kick failed), 2:58.